Nightstand in ash solid and quartered ash veneer in heather gray. Nightstand in ash solid and quartered ash veneer in heather gray finish. Includes three drawers and adjustable glides. Stainless steel metal inlay on top and drawer fronts. 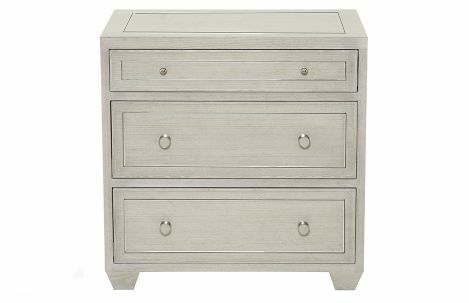 Inset leather drawer knobs in heather gray finish on second and third drawer.